You may have to avoid eating eggs if you consistently develop symptoms of gastritis, which is an inflammation in the lining of the stomach. Gastritis may be the result of an egg allergy, an egg intolerance or food poisoning. Report severe abdominal pain, blood in stool or vomit to your doctor immediately to prevent further complications. Avoid eating eggs until you can be seen by your doctor. If eating eggs causes symptoms of gastritis along with other symptoms, you may have an egg allergy. 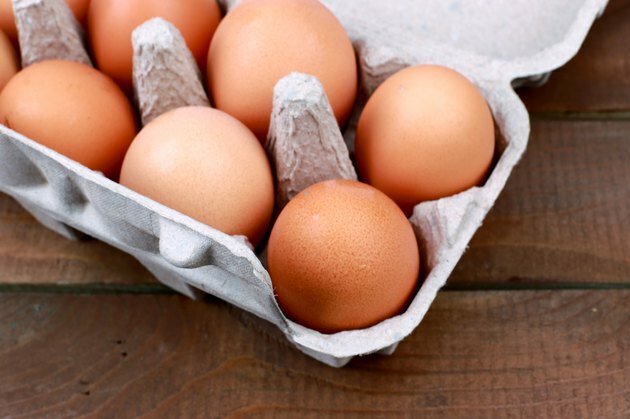 Eggs are one of them most common foods that trigger an allergic reaction. If you’re allergic to eggs, your immune system mistakes the proteins in the egg white, the egg yolk or both as a dangerous substance. The body overreacts to the egg proteins, sending a flood of chemicals into the blood stream to attack the proteins. The presence of these proteins causes inflammation in soft tissues throughout the body. An egg allergy may cause inflammation in your digestive system, skin, cardiovascular system and respiratory system. Egg allergies may cause shock in some people, and they can even lead to death in extreme cases. The University of Maryland Medical Center reports that about 25 percent of Americans believe they are allergic to a food, but only about 2 percent of the adult population is diagnosed with a food allergy. Many people confuse egg intolerance with an egg allergy. Egg intolerance can cause gastritis, not because of chemical reactions in the body but because of undigested proteins. Egg intolerance occurs when your digestive system is unable to break down the proteins in eggs, leading to inflammation, bloating, gas and diarrhea. Egg intolerance does not involve the immune system and will primarily cause digestive complications. Food poisoning from eggs can cause gastritis if the eggs you consume are contaminated with parasites, bacteria or viruses, according to MedlinePlus. Inflammation develops in the lining of the stomach and intestines that causes stomach pain, vomiting, nausea and diarrhea. If you suspect that you have food poisoning from eating eggs, call your doctor. In some cases food poisoning may cause severe symptoms. Dehydration is a common concern with food poisoning, so be sure to increase the amount of fluids you drink to prevent dehydration. If you develop gastritis symptoms from eating eggs, you may have a digestive condition. Common digestive conditions that cause gastritis symptoms include Crohn’s disease, irritable bowel syndrome and ulcerative colitis. See your doctor for a proper diagnosis and treatment options.